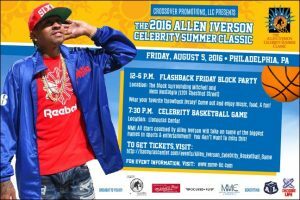 Join Allen Iverson on Thursday, August 4 from 6-10 pm at the Sheraton Society Hill, 1 Dock Street, Philadelphia, PA for a Celebrity UnGala 2016, a night honoring Allen Iverson for his contributions to the sports and entertainment culture. Then Friday, August 5, 12-6pm for FlashBack Friday Block Party at the block surrounding Mitchell and Ness, 1201 Chestnut Street, Philadelphia. The event will bring together the community with Allen and his celebrity guests for food, fun and games. followed by a Celebrity Basketball Game at 7:30pm at Liacouras Center, on the campus of Temple University. Join Allen and his celebrity friends from the sports and entertainment world for a night of fun and entertainment. Allen will be showcasing his coaching skills and interacting with his fans, you don’t want to miss this.